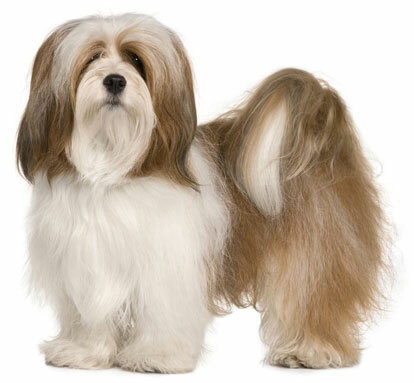 The Lhasa Apso is assertive, confident, protective, devoted, affectionate and steady. He bonds very closely with his owner. He prefers adults over children, although he can be with young children if they are supervised with him and if they remember to be kind and respectful to him. He is loving, outgoing, playful, and mischievous with his family, but aloof and suspicious with strangers. He's a good indoor watchdog who barks appropriately to alert you of a stranger's approach. He can be left alone while you are at work. He is happy to be indoors most of the time, but also needs a regular leashed walk or a romp in a protected park or yard. He can be jealous of other dogs, although if raised with them while still young he can be tolerant of them, and of other pets. He is not easy to train. He's an independent, strong-willed pet who is not necessarily interested in pleasing you, and will question why you want him to do things! He can be difficult to housebreak. He is not naturally obedient, but can be trained with patience, firmness, and a positive, consistent approach. He is a very low shedder, you'll struggle to find a hair in your home. The Lhasa Apso is 10 to 11 inches tall (to shoulders) and weighs 14 to 18 pounds. He has a long, thick, heavy, straight coat. His coat can be any color, including gold, cream, honey, gray, or a mixture of brown, white and black. Pet coat: Only needs to be brushed occasionally and clipped short every few months. Show coat: Should be brushed for 10 to 15 minutes daily to prevent matting and tangles, and trimmed every 6 weeks. The Lhasa Apso originated in the Himalayan Mountains as a guard dog for the nobility and for monasteries near the city of Lhasa, Tibet. He was first known as the "Bark Lion Sentinel Dog." Lhasa Apsos first arrived in America in the 1930's in the form of gifts from the Tibet's Dalai Lama. The breed was admitted to the AKC in 1935. His AKC popularity was 49th out of 157 breeds in 2007.